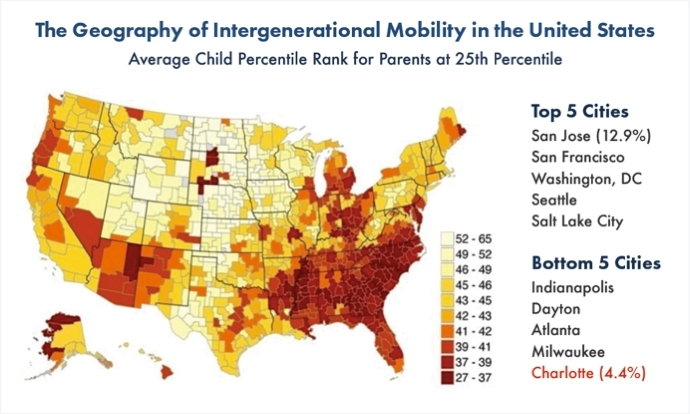 Yet, in 2013 when the headline broke about the Harvard University/UC Berkeley study that ranked Charlotte-Mecklenburg 50th out of 50 in upward mobilityii for children born into our lowest income quintile, many in our community responded with disbelief. How, on the one hand, can we be such a vital and opportunity-rich community, and on the other, be ranked dead last in the odds that our lowest income children and youth will be able to move up the economic ladder as they become adults? 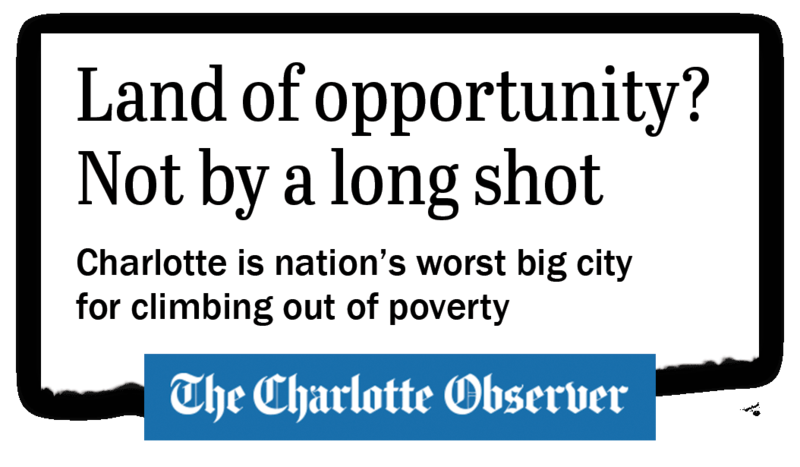 The reality that Charlotte-Mecklenburg may not always live up to its glowing headlines became wholly apparent in late September 2016 when, for 36 hours, the streets of Charlotte were in upheaval. What began as peaceful protests following the police shooting of Keith Lamont Scott, an African American father, quickly erupted into violence while the nation watched the situation unfolding on live network news. As protesters and police collided, the light-rail system and two interstate highways were shut down. The mayor imposed a citywide curfew, and the governor declared a state of emergency. The National Guard was deployed. Nearly 50 people were arrested, and 26-year old Justin Carr lost his life. People across Charlotte-Mecklenburg experienced the events of those September nights very differently. For many who view our community as a beacon of prosperity and live in relative comfort and affluence, Charlotte seemed an unfathomable setting for racial protests. However, for those whose voices have been ignored, or missed in our collective gazing at civic progress, it was no revelation that long-standing frustrations were finally being aired in the streets. The protests ignited by the police shooting of Mr. Scott and the string of similar incidents elsewhere have focused our collective attention on the stark racial, ethnic and economic divides that exist in our community but are rarely openly discussed. Charlotte-Meckenburg's story is a tale of two cities. Many parts of Mecklenburg County exist as bastions of opportunity where access to solid employment, high-performing schools, medical facilities, healthy food and safe neighborhoods abound. These environments translate into high numbers of students taking rigorous college-preparatory courses, attending summer camp, participating in student-exchange programs, and ultimately graduating from college and entering the workforce. In other parts of our community, a less sure path exists for young people and families. Businesses and services are scarce, jobs are few, and wages are low. Educators are challenged to lift proficiency scores in high poverty schools. Students are at higher risk of dropping out, and those who do graduate, are often less prepared for higher education, entry into the workforce or service to our country in the armed forces. 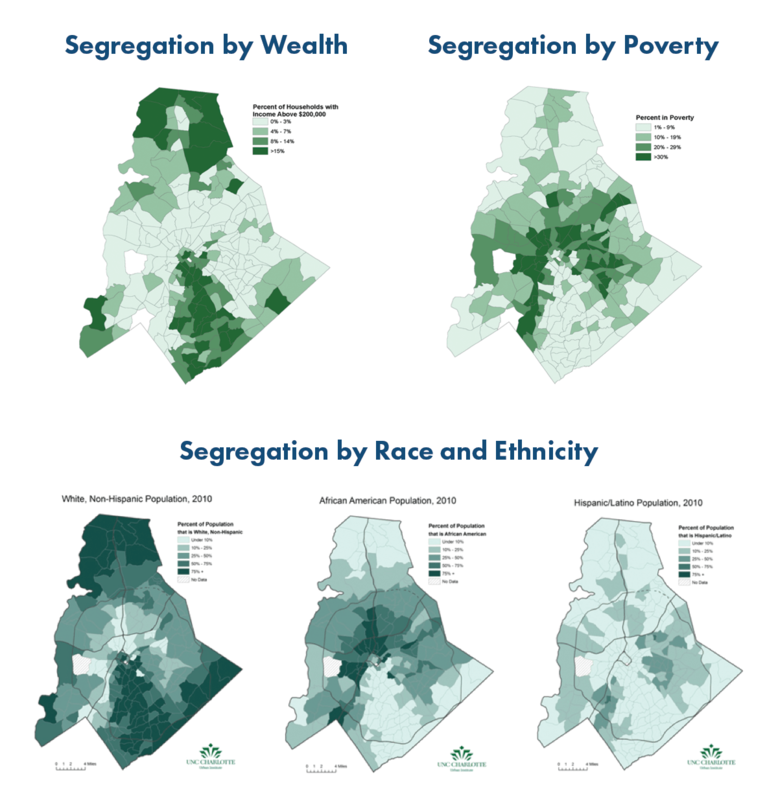 Segregation by poverty, wealth, and race/ethnicity are most apparent in Charlotte-Mecklenburg when we look at maps of the county that reveal an undeniable “crescent” of lower-opportunity neighborhoods wrapping around more prosperous areas of our community. People of color are in the majority within this geography. Many of our residents contend that Charlotte-Mecklenburg, with its developing skyscrapers, hot job market, and burgeoning cultural scene is not accessible to everyone, particularly for the people who live in low-opportunity areas. The Task Force’s work comes at a time in our community and country’s evolution when overall anxiety about the future is pervasive. We see this, not only among those with the least, but across all economic segments. We are all living in an uncertain world, trying to hold onto our sense of place and belonging. Collectively, we can hold on—together—with compassion, caring and respect for our differences and our shared humanity. The Equality of Opportunity study (“the Chetty Study”), undertaken by Harvard University and University of California, Berkeley, was led by Raj Chetty and colleagues. This groundbreaking report found that where a child is born has a dramatic effect on his or her chances of economic mobility. It focused on children in low-income families and measured economic mobility in two basic ways: how far these children moved up (or down) the income ladder as adults in comparison to their parents, on average, and the likelihood that these children would rise from the bottom fifth of the economic ladder to the top fifth by early adulthood. Chetty analyzed data from millions of de-identified tax records from parents of children born between 1980 through 1982 and then measured the income of those same children thirty years later. The study found that for children growing up in places like San Jose, the odds of moving from the bottom fifth of the national income distribution to the top fifth are 12.9 percent. Those are higher odds than the average in any other developed country in the world. In contrast, in cities like Charlotte, Atlanta and Indianapolis, a child’s odds of moving from the bottom fifth to the top fifth are less than 5 percent—less than the average any developed country for which the data was available. At 4.4 percent, Charlotte was at the very bottom of the 50 cities ranked in the study. We all know “rags to riches stories” and the Task Force has heard quite a few during community meetings. While these stories are real, a cultural myth surrounds them. When more deeply examined, it was rarely bootstraps, but rather a fortunate, and at times miraculous, interplay of networks, timing and socio-economic structures that came together, and combined with hard work and education, to produce exceptional outcomes. The diversity of these experiences establishes them as uniquely varied, without a hard and fast formula for success. When we perpetuate the bootstrap myth, laziness and lack of initiative are often seen as the reasons people remain in poverty. The assumption that people in low-income situations are lazy stems directly from the idea that poverty and financial vulnerability are problems we make for ourselves or hurdles we can overcome through hard work alone. The notion that anyone could be born poor and die rich, or immigrate to the U.S. and become a leader in their industry, remains widespread. It is not impossible; people do it. However, in our contemporary economic structure, it requires a great deal more than strong will and a work ethic. Personal responsibility is important; we cannot simply blame the system and use that as an excuse to do nothing. However, we also cannot afford to blame people and do nothing to address a deck stacked against children inheriting systems we know are biased and otherwise flawed. As the Chetty data shows, the American Dream is, for most, out of reach and highly correlated to where one is born and the environment in which one is raised. To improve the odds for our children and youth to achieve economic opportunity, this narrative and our expectations need to change. The ethos of bootstrapping, or scaling the socioeconomic ladder through individual effort, hard work, and personal responsibility is, by and large, an idealized narrative. Starting in late 2013, several nonprofit organizations began using the Chetty research as a clarion call for action and a catalyst for reviewing the effectiveness of past strategies. For some, it was an opportunity to look in the mirror and reflect upon their investments and programs in light of unsettling findings. In late 2014, then Mecklenburg County Commission Chair Trevor Fuller, called for the creation of a task force on poverty. After discussions with then Mayor Dan Clodfelter and a number of foundations, Commissioner Fuller agreed to focus on increasing economic opportunities and helped formed the Charlotte-Mecklenburg Opportunity Task Force. The 20-member Task Force assembled for the first time in May 2015 with a mission to address the community’s social and economic divide and the opportunity and mobility challenges that so many children, youth and families are experiencing. Our task was to investigate why the odds of moving out of poverty are so low for children born in our county and, based on our findings, recommend a plan of action to change this long-standing situation. Before we began our work, Brookings Institution scholar Richard Reeves, with whom we consulted during our process, warned that, “Task forces typically do few tasks and have little force.” We recognize that creating a task force when a sticky issue arises is the “Charlotte way.” We wanted to do things differently. Our Task Force was not a group of “the usual suspects,” the people who are always asked to sit at the table. Many of us had never been involved in community change work. Some of us came to the issue of economic mobility and opportunity somewhat uninformed. For others, our first-hand knowledge of inequality and lack of opportunity is deeply personal. We represent a wide range of backgrounds and perspectives. The Task Force was keenly committed to listening and learning. During our discovery phase, we met every three weeks for three hours, with several longer sessions covering many topics. We learned from over 50 national, regional and local experts across many disciplines, and from a diverse range of people in our community, including parents, teachers, teens, service providers, employers, and faith leaders. Among those who came to Charlotte to share their perspectives were Richard Reeves, Ron Haskins and Bruce Katz from the Brookings Institution, Robert Putnam from Harvard University’s John F. Kennedy School of Government, Erin Currier from The Pew Charitable Trusts, Scott Winship from the Manhattan Institute, Mark Edwards from Upstream USA, Joe Jones from the Center for Urban Families, Gerard Robinson from American Enterprise Institute, and Dr. John A. Powell from University of California, Berkeley’s Haas Institute for a Fair and Inclusive Society. Together, we participated in the Crisis Assistance Ministry’s Poverty Simulationiv, and most of us participated in the two-day workshop on Dismantling Racism by Race Matters for Juvenile Justice.v Both expanded our thinking about the day-to-day lives many people experience in our community and the deep impact structural racism has on opportunity. Through our discovery process, we learned much about ourselves and our community. Each one of us has been deeply affected by our experience together, and without a doubt, our genuine interest in and commitment to seeing change in our community has deepened. Two approaches helped us organize our exploration of issues related to opportunity and mobility, as well as factors that contribute to them. First, we considered a layered approach that illustrates “rings of support” that surround children and youth as they grow and mature. These rings of support include family, community, and systems/structures. We used this layered approach to help develop the agendas for our meetings and to identify experts from whom we wanted to learn. The second organizing approach was the life cycle continuum, which spans from an individual’s circumstances at birth through adulthood. Discussion around the life cycle continuum enabled us to look sequentially at the key factors influencing each stage of life, as well as the inflection points between each stage. Specifically, the transitions from early childhood to kindergarten, from middle school to high school and from adolescence to early adulthood are critical milestones in human development. The life cycle approach establishes benchmarks—or measures of success or failure—along the road to greater mobility from birth to adulthood. We borrowed the following Life Cycle Continuum from Strive Together and added intentionality of birth at the beginning of the continuum. Ultimately, the goal of our work was to create a strategic framework we believe will make a significant, enduring impact, along with recommendations to improve mobility and opportunities. Although we met for over 18 months, it was clearly not enough time to review every issue. As a result, this report should be considered a living document—one that we expect the community, leaders, and experts to add to, refine, and build upon over the next ten, twenty or even thirty years. One of the first big decisions we needed to make was to decide what underlying problem we were trying to solve. Some Task Force members came to the table convinced they knew what the problem was and had the answer to fix it. However, it soon became obvious to all of us we were wrestling with a very complex set of interrelated, systemic, structural and cultural issues that cannot be easily solved. We concluded our task was not to tackle the far-reaching scope of poverty and its impact on everyone living in our community, but rather, the inheritance of intergenerational poverty and its impact on the life trajectory of far too many of our children and youth. With inheritance of intergenerational poverty as our primary focus—that is, addressing opportunity for our lowest-income children and their families—we could not sidestep the conversation about race. Specifically, the role race plays in shaping the divergent narratives about children who grow up in different zip codes. We know many will read this report and conclude we are addressing only low-income, minority children. Targeted Universalism: A targeted universal strategy is one that is inclusive of the needs of both the dominant and marginal groups, but pays particular to the situation of the marginal group. As an example, Read Charlotte is working with a large number of community organizations to help increase 3rd grade literacy proficiency rates, currently at 39 percent across the district. But, within the proficient group of readers, wide variation by race and gender exists. White girls are at 72 percent proficiency while African American and Latino boys are at 22 and 18 percent proficiency, respectively.vi Even in the highest performing group, too many young girls are in danger of being off-track academically. In other words, we should establish a universal vision or goal that allows all groups to advance. Charlotte-Mecklenburg is a community that cares about all our children and youth—regardless of income, race or zip code—and is a community where all our children feel they belong, have big dreams, and find the opportunities to achieve those dreams. Our highest aspiration is that our leaders—governmental, philanthropic, business, faith, nonprofit, neighborhood, and grassroots—as well as the community at large, will willingly come together to reorganize our systems and structures, to change policies and practices, and to boldly embrace and rally around this vision. To realize this vision, our community can and must work together. As Robert Putnam, author of Our Kids: The American Dream in Crisis, said when he spoke in Charlotte in 2015, “These are all of our children.” Putnam’s directive cuts both ways: The Task Force is by no means suggesting that children born into upper- and middle-class families need to regress in order to improve the educational outcomes and life experiences of low-income children and youth. More affluent children and youth, too, need to thrive and move ahead. It is not a zero-sum game. Instead, we need to create a culture of caring that expands opportunities across our entire community so all young people gain access to the experiences, education, resources and support necessary to succeed as adults. Not only is it a moral imperative, it is an economic necessity when considering implications such as: increased costs related to health care, criminal justice and social services; employers being deprived of potential employees and customers; and the political instability likely to worsen if the gap between the haves and have-nots continues to grow. Key Determinants: What Matters Most? After considering all we learned from experts and research during our discovery phase, we framed our work moving forward around key “determinants”—the factors most likely to influence the opportunity trajectory of an individual. Hundreds, if not thousands, of potential determinants could influence a life. Our selection process led to fierce debates about what to include, what areas we have control over at the local and/or state level, and whether something is a determinant or an outcome. We had no argument about the importance of each issue; the debate was about prioritization. At one point in our process, we had identified six key determinants, but in the end, we narrowed the number to three: 1) Early Care and Education 2) College and Career Readiness and 3) Family and Child Stability. These determinants are inextricably linked: each connects to and reinforces the others. Therefore, they must be holistically addressed. In addition, we identified two factors we believe cut-across all three determinants: 1) the impacts of segregation and structural racism and 2) social capital. Both of these are powerful forces acting on access to opportunity. Impacts of segregation and structural racism suppress opportunity, while social capital—our relationships and networks— can dramatically increase opportunities. A number of reform efforts are underway (e.g. Project L.I.F.T., Beacon, etc.) that are still in the evaluation phase and are informing the future strategies for public schools. During our research, most experts and community leaders noted the lack of efforts aimed at early childhood and the “environmental” factors impacting student success. Many of our recommendations target positive student outcomes. We also believe investments in our public education system are critical, and we support growth in funding of the Charlotte-Mecklenburg Schools Foundation. Research is split on the short-run impact of a minimum wage increase for workers’ employment levels and overall pay. Additionally, minimum wage increases do not necessarily benefit the population of interest in this report and can mask key underlying workforce skill needs. Elsewhere in this report we have provided recommendations on wealth accumulation, job progression assistance (workforce skills), and the earned income tax credit (EITC). We believe these may be more impactful paths to increase a family’s income. Data is scarce to support healthcare as a standalone determinant of mobility versus an outcome of other social factors. Notwithstanding, we have included healthcare in our discussion of healthy pregnancy outcomes and mental health. Finally, we are also encouraged by the recent announcements from Carolinas HealthCare System and Novant Health regarding their intentions to collaborate on initiatives aimed at improving health outcomes in low-income and underserved communities. In addition to providing traditional healthcare, we are hopeful these entities will embrace and implement our report recommendations. The Task Force believes focusing on systems and structures versus programmatic intervention will more effectively tackle intergenerational poverty and break down barriers to economic opportunity. Programs are critically important; however, they generally deal with the symptoms of problematic, complex systems and structures. By addressing systems and structures, we focus our attention on underlying policies, practices, and mindsets that produce some negative outcomes we see with our children and families. 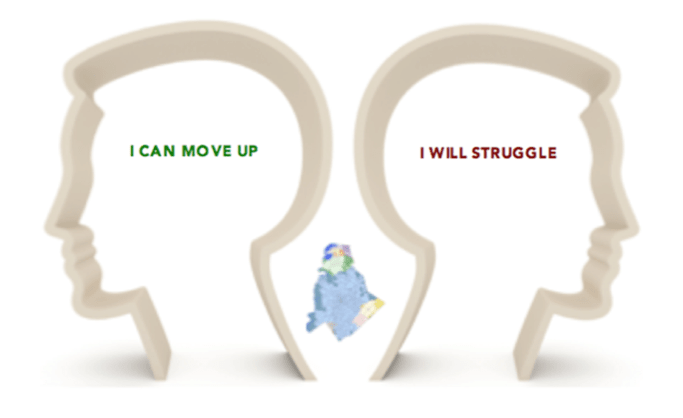 Therefore, the strategies and recommendations we propose for each of the determinants and cross-cutting factors are, for the most part, focused on systemic or structural change and improvement, while some of the associated tactics we suggest for implementation are programmatic or activity-based. Our Children. Their Future. Our Commitment.